Climate change is having a significant impact on water resources globally; more so in developing countries due to lower resilience and weakened coping mechanisms. Water resource and supply management systems need to be adaptive to the uncertainty and unpredictability posed by this challenge. The current water crisis is mainly that of governance within the water sector. 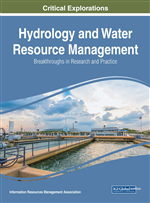 On this premise, this chapter seeks to explore the adaptiveness of water management institutions and systems to climate change impacts, with a focus on Kenya's case. Kenya continues to face numerous challenges relating to water supply, which are further exacerbated by climate change. Prior to the development of key legislative and institutional frameworks, through adoption of the Water Act 2002, the water sector grappled with gross mismanagement, manifested via inefficiency in water service provision and resource degradation. Deploying the conceptual model of adaptive (co)-management institutional prescription of polycentric governance, experimentation, public participation, and management of bioregional scale, this chapter stands to contribute novel insights into designing sustainable, adaptive water governance regimes. Water is a vital component of an ecosystem and is crucial for survival, yet scarce with only 0.1% earth’s water being both accessible and in usable form. Despite this critical resource being a prerequisite to society’s development, water security has become a global challenge in 21st century (Gunawanasa & Bhullar, 2013; Hanjra & Qureshi, 2010) Water scarcity is being experienced across the globe, with the same being exacerbated by the adverse impacts of climate change on water resources. In the recently concluded climate change negotiations (COP21) held in Paris in the year 2015, where parties to the United Nations Framework Convention on Climate Change (UNFCCC) ushered in the Paris Agreement, the issue of especially the most vulnerable countries’ resilience and adaptation to the adverse effects of climate change (UNFCCC,2015). Globally, the impacts of climate change are being felt disproportionally and with differing magnitudes. Developing countries continue to bear the brunt of climate change impacts as compared to developing countries due to their low resilience and adaptive capabilities. In developing nations, research on vulnerability to climate change shows that the marginalized groups of people are most vulnerable as often they are excluded from the planning and decision making process (Tompkin & Adger, 2004). Poor communities in the developing world thus face serious challenges from climate change impacts on water, as this water insecurity has direct impacts on poverty alleviation. Consequently, their pathways to sustainable development become jeopardized. The developing world thus suffers from increased water insecurity manifested vide unpredictability and high variance in precipitation as a result of climate change (Goswami et al., 2006). Global South nations continuously face an uphill task with regard to realizing water availability for their populace; a fundamental human right (Gunawansa & Bhullar, 2013). Studies indicate that about two billion people globally currently live in either water scarce or water stress areas (JMP, 2012). Countries that are water-scarce or water-stressed require concerted efforts in managing the few available resources, more so in the wake of climate change impacts. Climatic variability is affecting the ecosystem through water as a medium, with manifestations ranging from prolonged droughts in La Nina to excessive flooding during El Nino periods (Moser & Boykoff, 2013) This consequently translates into water insecurity across the globe, with local effects like prolonged drought in Horn of Africa (Eriksen & Lind, 2009; Huho et al., 2011) and destructive weather events like the typhoon Haiyan in Philippines (Chiu, 2013).